Handmade Backpacks 100% local. Based and created in Barcelona. 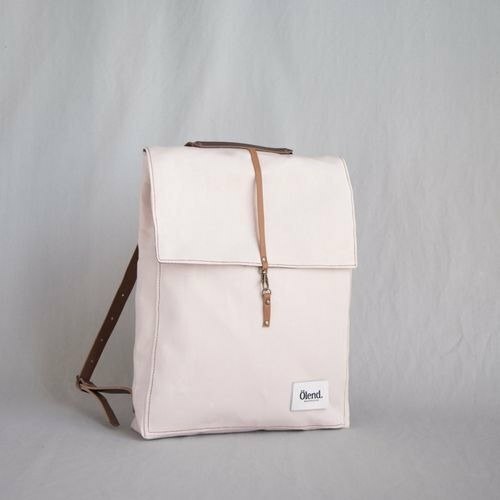 Ölend Backpacks ● Made in Spain ♥ Product size: 43cm x 32cm approx ♥ Resined awning fabric and natural leather ♥ Made in Spain ♥ 100% Hand made ♥ Available in six colors: Mustard, Grey, Bourdeaux, Navy, Pale Rose, Camel, Handmade Backpacks 100% local. Based and created in Barcelona. Ölend is the adventure of Frank Rios, Adriana Dumon and Antonio Longás. They started making their own backpacks and their friends liked them so much that they decided to start producing some on demand. They make each backpack by hand. The story behind Ölend is about travelling, is about challenges. It is inspired by the spirit of the mountaineers from the 40´ and 50´s. All of their items are exclusive and there are not two identical backpacks. Ölend is a commited supporter of high quality product, 100% local and made with patience and care. Spanish leather has long been applied to luxury leatherware by designer brands. With great material at hands, Spanish brands (e.g. Loewe, Camper, Carmina) are able to create beautiful products that enjoy worldwide popularity. Ölend insists using only Spanish leather not only because the pride to its Spanish origin, but also because the intention of simply making best products, by hand. **Holden** Is a stylish, light, durable, daily used backpack. https://3.bp.blogspot.com/-ya17IaM5dEE/VqjQZL9O1nI/AAAAAAAAEoI/r1bZKkMbSIM/s1600/IMG_4498_Fotor.jpg https://2.bp.blogspot.com/-jYdZRvbL7Eo/VqjQY4u9hHI/AAAAAAAAEoM/ZaU7TZoOEoI/s1600/IMG_4500_Fotor.jpg https://1.bp.blogspot.com/-he3jHcRm0VA/VqjQY4hn7QI/AAAAAAAAEoE/d5av6DavDAU/s1600/IMG_4501_Fotor.jpg ▲One inner pocket The inner pocket can accommodate for an object of IPhone 6+ size/ coin purse /credit card etc. It suitable for your 14" laptop and, meanwhile, contains your belongings for work, school, or even weekend trip. https://4.bp.blogspot.com/-JVcpgVty6FY/VqjQbstVC5I/AAAAAAAAEoc/AkjLF2FtSVw/s1600/DSCF2486.JPG ▲To ensure durability, metal parts are applied to straps, handles, buckles, and all other parts that connects leather and canvas. Ölend believes this is a better way than just stitching. You can freely adjust straps through metal buckles to better accommodate your body figure. **Cleansing** To clean your Ölend backpack, please gently rub it by rubber eraser. In the case eraser doesn't work, please apply clean cloth that dipped in neutral detergent to rub the stain with some water, and dry the backpack in shade.